Twelve years ago this month, I began working for Steven Raichlen, the world’s foremost authority on international grilling and barbecue. My first major project was testing recipes for Steven’s book Best Ribs Ever. My brand-new Weber Performer—I didn’t own a smoker in those days—and I turned out slab after slab of ribs during the spring of 2005, which I would vacuum seal and pack with frozen gel packs and overnight to Steven’s home in Miami. Pastrami Ribs. Mint Julep Ribs. Even tongue-in-cheek Rabbi’s Ribs. But my absolute favorite ribs were Cousin Dave’s Chocolate-Chipotle Ribs. What a hit they were at that year’s Fourth of July bash! They were slathered in an irresistible wet rub featuring chipotle chiles, fresh lime juice, and just the right dose of heat-taming chocolate, much like Mexican mole, then indirect grilled at a fairly high temperature—325 degrees with soaked wood chips for about 2 hours. Those were good bones. Superlative bones. Why have the ribs I’ve made lately not measured up? I’ll tell you why. Because I was seduced, as were many barbecuers, by the 3-2-1 method. That’s where you smoke the ribs for 3 hours at 225 degrees, wrap in foil for 2, then unwrap and sauce for the last hour. What was I thinking? The meat was tender, almost bordering on mushy. The bark was soggy after its steam bath. And the flavors were what I can only describe as washed-out. The 3-2-1 method and I are officially parting ways. I’m going back to the lessons I learned when testing recipes for the rib book. Are you with me? • Use a butter knife to loosen the tough membrane on the back of the ribs (called the pleura). Wiggle the blade under the membrane on one of the middle bones and lift it upward. Use a dry paper towel to tear off the membrane. Be patient. Sometimes, it tears. You can skip this step—some barbecuers do—but the membrane isn’t edible and impedes the absorption of smoke and spices. • Apply dry rubs generously just before grilling or smoking the ribs. If allowed to sit for several hours, salty rubs will begin to cure the meat, toughening it. Work over a rimmed baking sheet to contain the mess. • “Moisturize” the ribs before cooking by slathering them with a paste made with cheap yellow mustard (Steven prefers Dijon) and a bit of Worcestershire sauce. Mayonnaise is another option; both lay down a base layer of flavor, but neither are perceptible in the final taste of the ribs. • You can buy “St. Louis-style” ribs—spare ribs that have the sternum, cartilage, and rib tips removed—but it is easy and usually cheaper to trim a rack of spares yourself. Use the trimmings to flavor beans or collard greens. • Create a humid environment in your grill or smoker by placing a foil pan full of water or fruit juice underneath the ribs. Or you can fill a food-safe spray bottle with water or another liquid (like apple cider) and periodically spray the ribs to keep them from drying out. • Test for doneness by inserting a toothpick between bones. It should go in easily. Alternatively, pick a rack of ribs up in the middle with tongs. If the meat begins to shred where it’s held by the tongs, the ribs are tender. The shrinkage of meat from the bone is another sign of doneness: the meat should recede from the ends of the bones by about 1/2 inch. • Generally, apply barbecue sauce, if using, to the meat the last few minutes of cooking. Most sauces contain sugar, which will easily scorch if exposed directly to the flames and heat. • Use a sharp knife to slice between the bones (I like to work from the back side as it’s easier to see where to make the cuts) to avoid shredding the meat. I hope you try Cousin Dave’s Chocolate-Chipotle Ribs. If you do, please share your impressions with us on Facebook, Twitter, or Instagram. 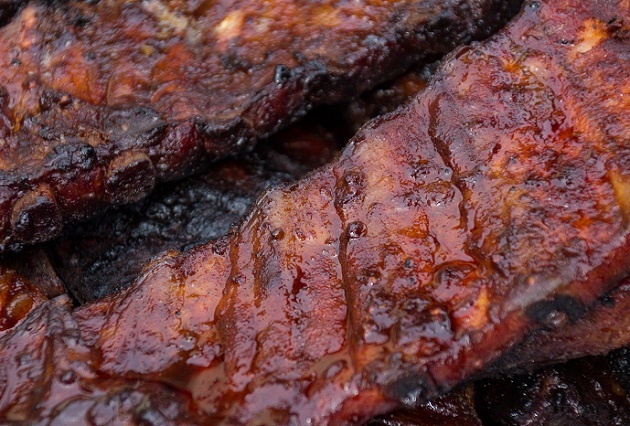 Click here for the fail-proof 3-2-1 method for cooking ribs.